How do I know what type of armored vehicle is right for my needs? Choosing armored vehicles depends upon what you'll be using them for. Luckily we offer choices for every use under the sun. Our inventory includes armored vans, armored trucks, prisoner transport and Police SWAT vehicles, rapid deployment vehicles, Suburbans, and military tactical vehicles, to name a few. Evaluate your needs, and let us help you find your vehicle of choice. Learn more about our great line of tactical vehicles today. 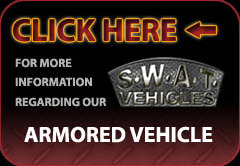 What types of armored vehicles might be right for you? Take a look around and see for yourself! From armored vans and armored trucks to rapid deployment vehicles, armored tactical vehicles, Suburbans, prisoner transport vehicles, and military tactical vehicles, we feel certain we can help address your tactical needs in a practical way. Our armored vehicles run the gamut and address a variety of uses and needs. As such, it shouldn't be hard to find the one that works for you. With armored vans, armored trucks, Police SWAT vehicles, and much more to choose from, we're excited at the prospect of helping you with your tactical pursuits.